Well, everyone seems to be in "Back to School" mode and I guess I'm no exception, only this year, it's quite different! No need to rush out to battle the crowds to purchase items from school supply lists or look for sales on new wardrobes for the kids. Instead, I'm transforming our downstairs play area into a "learning room" where we will begin our homeschool days beginning on Monday, August 18, 2014. I am SO thrilled to see what God has in store for our family in the months (and years?) ahead!!! So here in SC, you have 3 options by which to homeschool, and I thought I'd discuss them here, mostly since this blog serves as a journal of sorts to help me remember things and this decision to homeschool was a pretty big one---as you might imagine! Under a SC public virtual school, which basically brings the public school classroom (and it's curriculum, from www.k12.com) into your home. As a parent, you don't really "do" anything except ensure your child is completing assignments and online schooling through the virtual school. You're held to the same requirements of public schools (testing, calendar/holidays, deadlines, etc.) and have literally zero control over anything. While this was my original plan when I first considered homeschooling, God took me in a different direction when He helped me realize Option 1 doesn't provide me with either of the two things I wanted most out of homeschooling: FLEXIBILITY in our schedule and the ability to CHOOSE the curriculum I would use to teach my children. Under the SC Association of Independent Home Schools. This option provides accountability for homeschoolers, curriculum selection assistance (especially helpful for first-time homeschool parents) and record-keeping services. After I realized Option 1 wasn't for us, I quickly turned my attention to Option 2. It's basically a way to embark on homeschooling with someone holding your hand the whole time, giving you directions on where to go and how to get there, and taking away the burden of keeping the necessary records that meet state requirements for your students. YES!!! I wanted to go this route because I didn't believe I could do it on my own. Homeschooling is a very overwhelming thing to even consider doing, much less actually executing it! But again, I felt God telling me He was with me in this endeavor and He would see me through. So then I began to look into Option 3. Under an independent association for homeschooling. This is the one that provides the most freedom to families. But it is also the one that puts the largest burden on the parents. With this option, you join an association (there are several in SC), and that's that. YOU as the parent select ALL of your child's curricula, YOU are responsible for keeping and maintaining their grades and records, YOU are responsible for 100% of the instruction. It's a LOT to consider, but I know without a doubt that THIS is where God has led us. 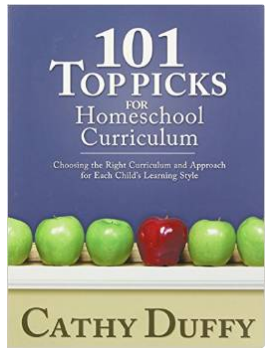 I began by purchasing this book: 101 Top Picks for Homeschool Curriculum by Cathy Duffy. I ate, slept and breathed this book for MONTHS. Literally. After my extensive research with this book, I felt confident enough to select the curricula I would be using for my first year of homeschooling -- for both LO and Chase. It was so overwhelming and so important to me to try to make the best selections possible that it certainly deserves its own post! Watch for that to come soon. I've felt God's leading in this entire process (a dear friend once told me, "God leads, Satan pushes.") and I feel confident about what we're going to do. As if it that wasn't enough (It is. ), He is continually reminding me that I'm on the right path. My latest confirmation was from when I requested LO's cumulative file from her old elementary school. It contained her report cards and some test results (that I had never seen). I was particularly surprised by the results of a test she took back in Kindergarten where her skill level was "Above Average" in all areas, and the "Instructional Recommendation" was "Consider Need for Individualized Instruction." Seriously? First of all, I'm so happy because individualized instruction is EXACTLY what she will be receiving at home. :) And secondly, I was disappointed (though not surprised) that the school noted the need for her to receive additional, individualized instruction 2 YEARS AGO and even with my constant prodding of her teachers and the administration, the school never made any effort to provide her with advanced learning opportunities. I couldn't be MORE PLEASED with our decision to homeschool, and I can't wait to see how it all plays out! NOTE: If you are interested in reading the full SC Code of Law §59-65, which includes Compulsory Attendance and Home Schooling Statutes, please click here. I'm so impressed!!! I LOVE the "idea" behind homeschooling and the philosophy, but it's not something God has ever impressed upon my heart. Honestly, partially because of my own failings (patience and "teaching" aren't some of the attributes that come easy to me!!!) I struggle just helping with homework! That, and we are super blessed to live in an AMAZING county that invests a lot of money into our schools to make the top notch, so I'm pretty pleased (so far!) Now, if I lived in a different area... God might try to whip me into shape and kick my booty to homeschooling, LOL. I'll be praying for y'all this year, that the transition is a smooth and super enjoyable one for all!! !